During the Young Farmers’ Clubs of Ulster AGM and conference that was sponsored by Massey Ferguson, one of the world’s leading farm machinery brands, YFCU members entered a photo competition and were asked to complete the following sentence: “I love the Young Farmers’ Clubs of Ulster because…”. The selection of photographs along with the captions were then placed on the YFCU Facebook page and the public were asked to vote for their favourite entry. 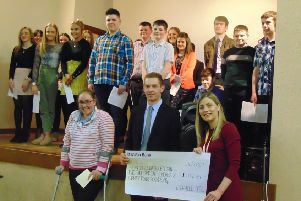 Ashley was awarded £100 to spend in the Massey Ferguson online store.